View our Summer programming at the Parsons Center! 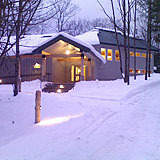 The EMU Parsons Center for the Study of Art and Science is located on 86 acres of wooded land in northern Michigan, approximately 15 minutes from Traverse City. The property contains housing and studio space where a variety of classes and workshops are held that take advantage of the beautiful natural surroundings. The Center is the legacy of the late Jean Parsons, renowned sculptor and potter, and is run by the College of Arts & Sciences with attention from the School of Art & Design and the departments of Biology and Psychology at Eastern Michigan University. The Parsons Center for the Study of Art and Science. 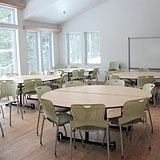 Housing accommodations in the new Sleeping Lodge include two beds, chairs, dressers and closets. Outdoor camping in canvas platform tents is also available. Students should plan on bringing their own sleeping bag, sheets, blankets, pillows and towels as well as all personal bathroom items like soap, shampoo etc. Though arrangements vary from class to class, students generally take care of their own breakfast and lunch. Dinner is typically communal style, cooked by members of the class. 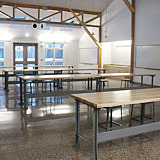 The Dining Commons has a well-equipped kitchen. Frequent trips into TC and Lake Ann allow adequate access to groceries. For further information regarding the Programming at the Parsons center, visit the Extended Program's Parsons Center website.